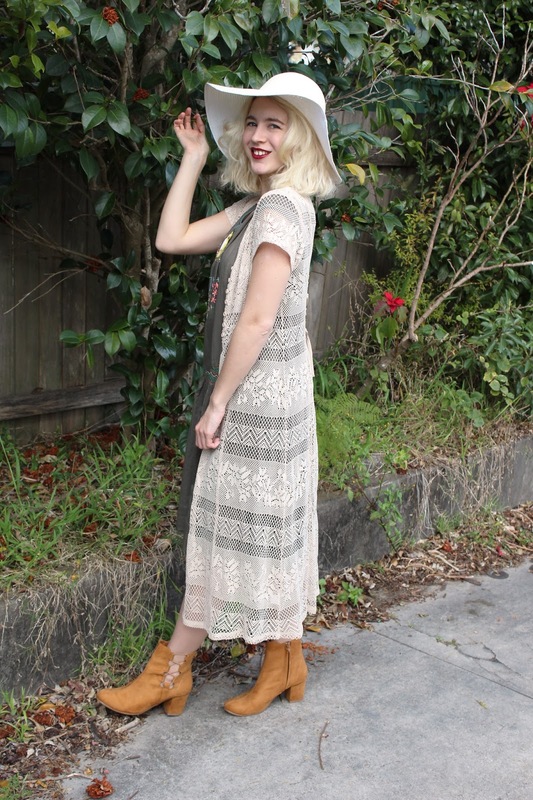 Laidback in a Lazybones dress! 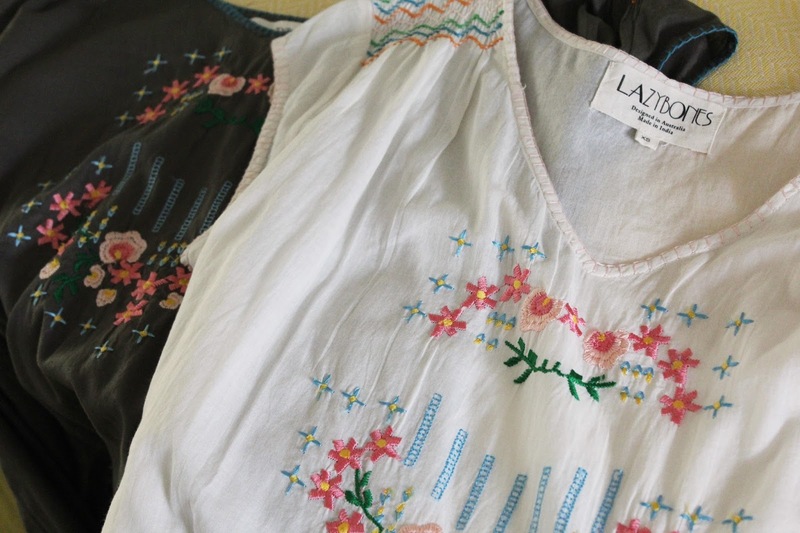 Back in May I received these gorgeous dresses from Lazybones... I spied them earlier in the year and thought how great they would be for boho looks, twenties style with the drop waist and as the perfect lightweight dress to chuck over top of bikinis during summer. When I did my first blog post featuring Lazybones the weather was starting to cool and so these got tucked away for a a few months and now it is warming it up I could not wait to pop one on. 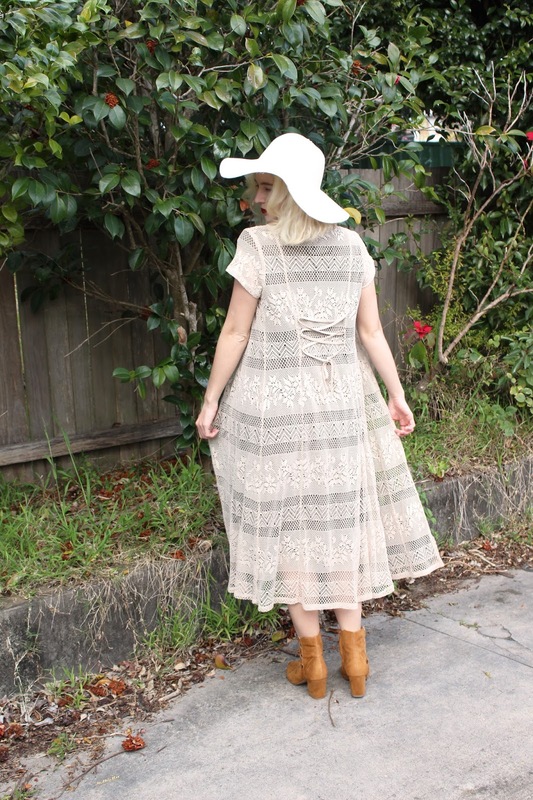 I have these dresses in size xs and they have quite a large fit as it is meant to be such a relaxed style, it really does make it a perfect design for those hot summer days when you feel like you are melting. 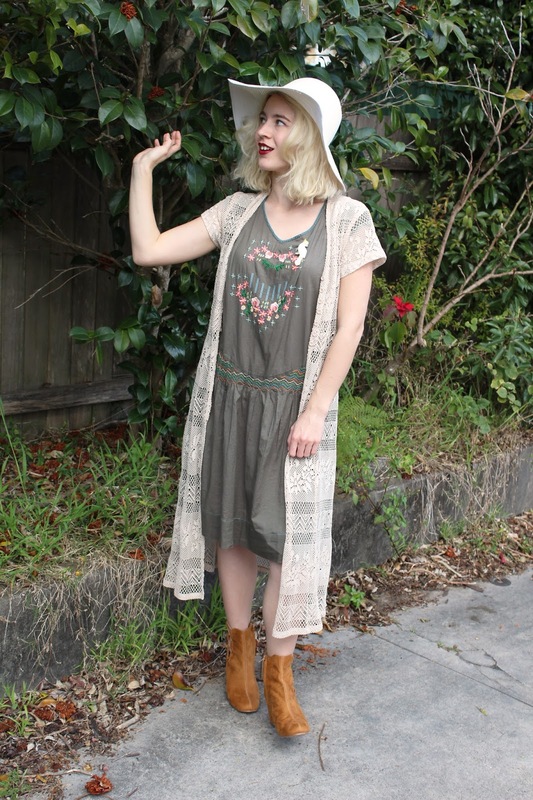 As a lover of boho and laid back 70s looks I have been experimenting with outfits like this and adding more pieces to my wardrobe. 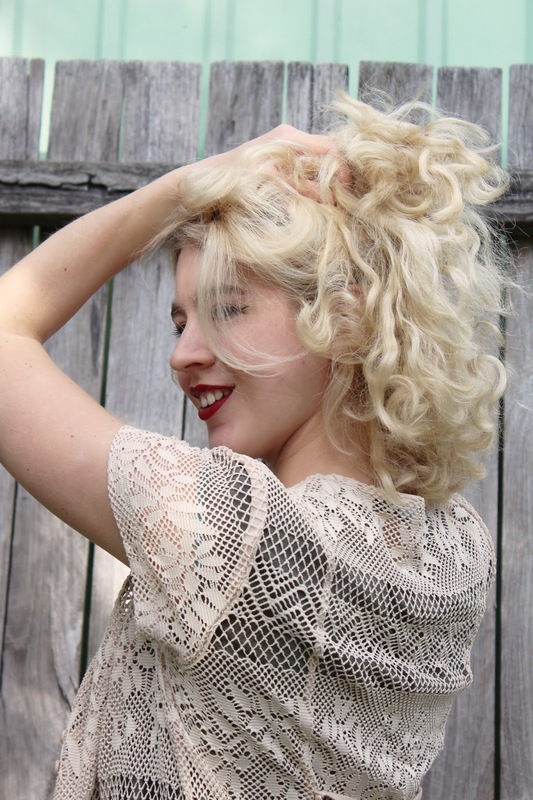 My hair was in it's natural state this particular day and I put together all of these newly acquired pieces to form this look. It was comfy and so nice to wear on a warm spring day. I wore a light vintage slip underneath but could not pass up dark red lips. 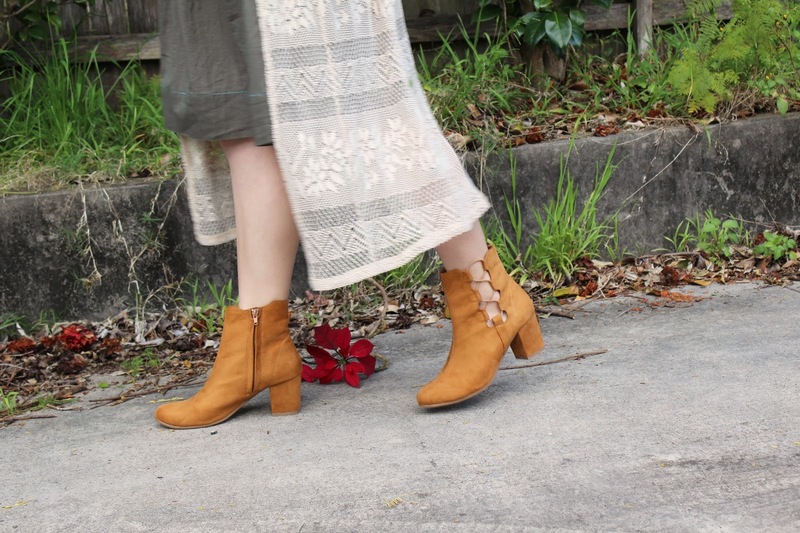 I recently purchased five pairs of boots in an end of winter sale... Finally I found boots I like and it only cost me the price of one pair, so I am pretty damn happy about that. 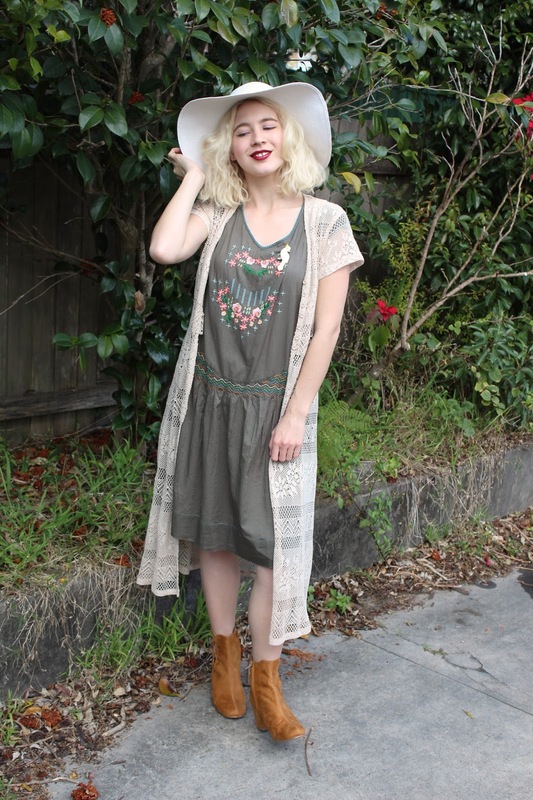 I love this particular style with boho/70s looks! 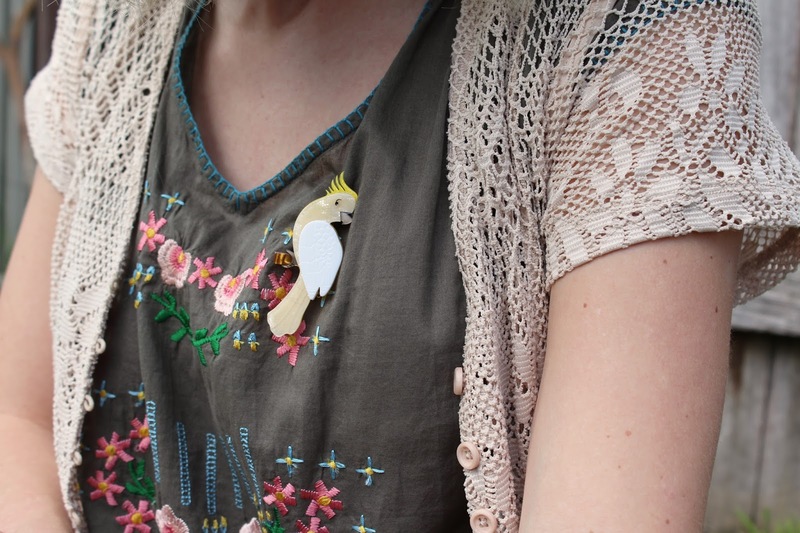 I pinned my Erstwilder brooch to complete the look... I love Cockatoos they are such beautiful birds and quite cheeky. They always visit my mum's neighbourhood and we watch the black cockatoos fly over the bush lands as well. I hope you have a great weekend.. I am catching up on blogging, hanging out with family and hopefully spending time by the water and of course I need to get some house work done. 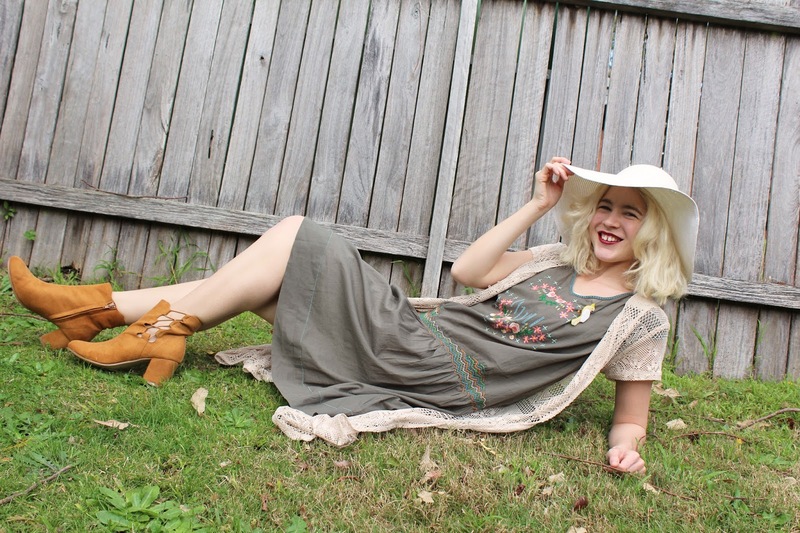 I do like seeing your boho looks Kayla! I can see you love playing with different eras as much as me. Great score on the winter boots. Have a super weekend, we're visiting family and going to a food fair! 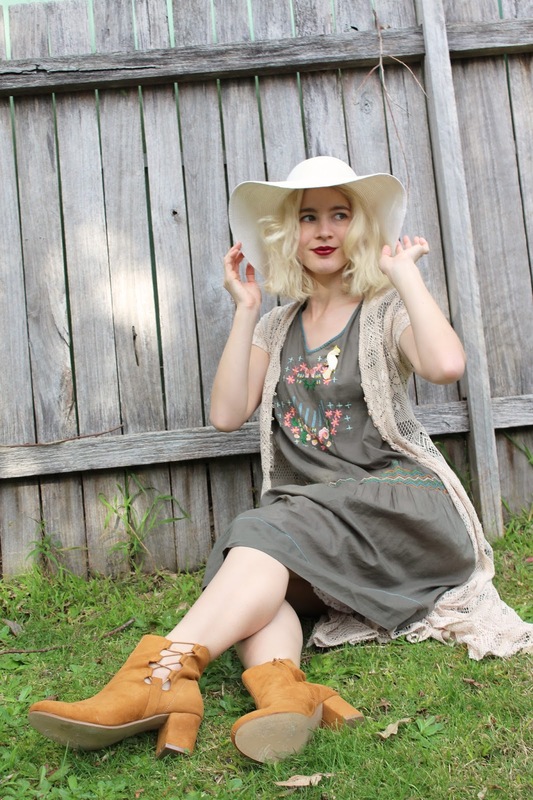 So pretty seeing you in boho looks Kayla. You wear it very well. I love this outfit with your natural hair and those boots and the Erstiwilder brooch are just the perfect finishing touch! Congrats on the end of winter boots score! What a great outfit! I love your style, gorgeous lady. Such cool, easygoing look. It strikes me as something a fashionista from the 1920s might wear if she was suddenly transported to today's world. Such a gorgeous, relaxed look. This dress looks so cute on you! Looks lovely there! your outfits are perfect too; very seasonal and classy! :) You have an amazing style! I love all of your posts. The quality of your pictures is amazing.